Within the Steam Turbine there are three separate sections, each of which is rotating under the influence of a different aerofoil. This turbine is supplied with steam by water circuits in the HRSG. The HP line supplies the HP Steam Turbine (1) while the IP circuit along with reheated steam from the HP circuit supplies the IP Steam Turbine (2). The LP supply line is introduced after the IP Steam Turbine but before the steam reaches the LP Steam Turbine (3). 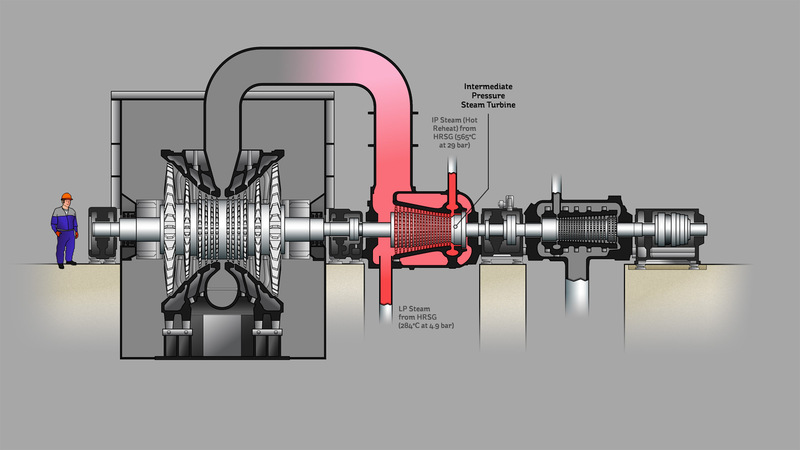 The turbine sections all share a common horizontal shaft that is used to transfer kinetic energy to the Electrical Generator while the plant is operating to full capacity (above the synchronous speed). This is the case during periods where the thermal energy in the HRSG is sufficient to generate enough steam to rotate the second turbine at a high enough velocity.